Recorded at the Chameleon Studio. Sample from 'The Sweetest Pain' (Wansell / Biggs). Hands down, 2 of the greatest house tracks every made. If you love deep house, tech house or just beautiful dance music in general then you should know these tracks. If you are a house DJ and you aren't aware of Global Communication aka Tom Middleton and Mark Pritchard then shame on you, sort it out!! haha. The Way (Secret Ingredients Mix) fits perfectly to Global Communications - Space Jazz Mix of Azymuth's "Jazz Carnival". It was a standard of my set in the end of 90s! This is the record that got me hooked madly on Deephouse..
Much has been said about this tune - so apologies in advance but I'm gonna say some more. 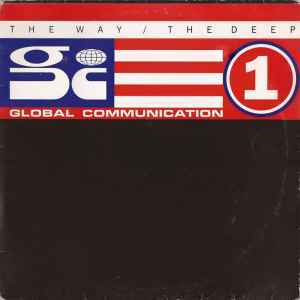 Prior to this Global Communication released some of the finest ambient electronic music you could hope to hear. (Splurge some cash on their re-interpretation of Chapterhouse's indie rock album - you won't be disappointed.) If you've followed Mark Pritchard, you'll be aware that he is one of the finest producers alive - not only taking in every dance movement going, but also giving beautiful music for heads to listen to. This track is a perfect example of how sampling can be a truly positive force in music. One well worked vocal loop of Dexter﻿ Wansel's 'The Sweetest Pain' is spun out so carefully that when the record ends and you want to hear it again. Pritchard and Middleton didn't collaborate on many house tracks (in fact, of the two, Middleton went on to make more music in this style) and when you've achieved this highly, I can understand why. Mesmeric, danceable, headphone-friendly genius. 'The way' is a staple for deep-house lovers and electronic music fans in general. And I haven't even touched on the flip (check the deep dish remix). Got my copy when it was new priced £1.99 coz it was 'record of the week' in my local independent. Days gone by. When the Groovejet crew (spiller) spinned this track to open his set, he opened my mind as well. A whole new perspective grew inside me to define deep house music. It still surpices me, that a simplistic and monotone tune, like the 'the Way, secret ingedrients remix' is, can lie so far in front of his time, that now 10 years later, this vinyl still earns the crown of deep house. It was years later when Arnold Jarvis and Chris Gray picked up what Global Communication invinted. A classic for all those experienced deep house lovers who enjoyed it before the millineum.